Robin Roberts, who at 54 enjoys so much personal and professional success, has also overcome a great deal of adversity along the way. The first to admit that she never dreamed she’d go so far, so fast, Roberts opens up in an emotional interview with AARP the Magazine, in which she reminisces about some of her most memorable experiences. In a wide-ranging interview, covering everything from the time she openly wept on-air while covering Hurricane Katrina to the day she returned to co-anchor ABC’s Good Morning America after her bone marrow transplant, the television broadcaster expresses fear and gratitude, happiness, and pride, as she talks about the path that led her to being the gutsy, go-for-it — but empathetic — woman she is today. 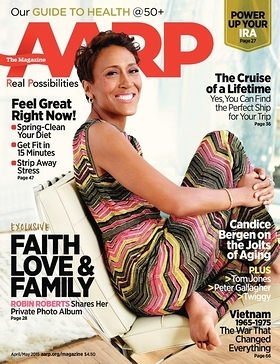 The following are excerpts from the April/May issue of the AARP The Magazine cover story featuring Robin Roberts, available in homes today and online now at www.aarp.org/magazine. "I think of September 20, the date of my transplant, as my birthday more than my real birthday, on November 23. I don’t try to be like people who have had life-threatening illnesses and say, ‘Every day is a gift.’ But everything that happens from now on is lagniappe, as we say in the Gulf." "Just the emotion of seeing people who I know didn’t think they were going to see me again. Some people were, like, why were you in such a hurry to get back? It wasn’t about being back on TV. It was about being back in life. I could’ve stayed longer in an isolated room, but I didn’t want life to continue to pass me by. I wanted to participate in life. Put me in, Coach. I’m ready to play." "Yes, for the president of the United States of America to change his stance on marriage equality, that was huge. And to be the person across from him asking that question! But see the little look on my face? I’m reacting to my producer on the side, who’s just held up one of those blue cards. I was guessing the sign was going to say, ‘You rock!’ Instead, it says, ‘Lipstick on teeth!’ As my mama used to say, ‘When you strut, you stumble.’"
"Covering Hurricane Katrina was a real moment for me, personally and professionally. On the air, I broke down and cried when Charlie Gibson asked about my family. I had just found my mother and sister within the hour. They hadn’t been able to evacuate because my mom was ill. The family house was damaged, but they were fine. After the broadcast, I remember taking my earpiece out and thinking, ‘I don’t have a job anymore.’ Because it was a time when you didn’t show emotion like that." "Good Morning America had said to me, ‘If you could do anything, what would that be?’ My father was from the famed Tuskegee Airmen. I said, ‘I want to fly a plane like my dad did.’ Now, I didn’t mean I actually wanted to fly a plane that he flew! But we went back to Moton Field in Tuskegee, Alabama, and this old thing comes chugging down the runway. I’m, like, ’I’m getting in that?’"
"Pat [Summitt] was diagnosed with early-onset Alzheimer’s disease in 2011. I keep in touch, and she has more good days than not. I had always wanted to be a Lady Vol under her at the University of Tennessee, but, thinking about it, we probably wouldn’t have the friendship we have now if I’d been her player. I’ve got her back. And I love that she’s got a hashtag: #WeBackPat." For the complete interview, along with behind the scenes video and images, click here.